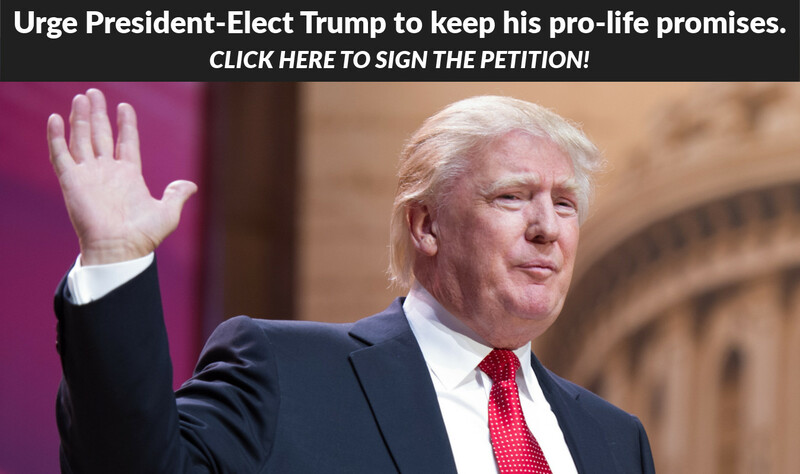 URGENT: Call on President-elect Trump to keep his pro-life promises! Sign the petition now. November 9, 2016 (LifeSiteNews) – Pro-life leaders say Donald Trump's astonishing victory means Planned Parenthood is "fired" and they will "hold the new administration's feet to the fire" to ensure Trump keeps his pro-life promises. Voters "overwhelmingly rejected" the $30 million Planned Parenthood poured into electing pro-abortion candidates, the March for Life tweeted, echoing social conservatives' relief that Hillary Clinton was not elected. "This is our time," said Kristan Hawkins, President of Students for Life of America, which released a meme telling Planned Parenthood, "You're fired." Gary Bauer called Trump's win a representation of the "American Revolution 2.0." "Our job as defenders of life and family begins again today," said Human Life International President Father Shenan J. Boquet. "Let us pray that Mr. Trump will adhere to his campaign commitments regarding respect for life, and pray that he is surrounded with men and women of deep faith and strong integrity—men and women who have the courage and conviction to make the radical changes our government requires at this point in our nation’s history. With what appears to be Republican majorities in both Houses of Congress, he should be able to deliver on his pro-life campaign promises, especially defunding Planned Parenthood." The Susan B. Anthony List's Marjorie Dannenfelser said Trump's victory and pro-life majorities in the Senate and House are a "historic moment for the pro-life movement" that present key opportunities to "end painful late-term abortions, codify the Hyde Amendment, defund Planned Parenthood, and appoint pro-life Supreme Court Justices." Operation Rescue's Troy Newman said now is the time to "hold the new administration’s feet to the fire throughout Trump’s presidency, to ensure that promises are kept, the innocent are protected, and the corrupt Abortion Cartel is utterly defeated." "This election victory means the end of the HHS mandate," Priests for Life National Director Father Frank Pavone said. "We see a bright light at the end of the tunnel." "When the abortion lobby pushed for unregulated abortions through all nine months of pregnancy and forcing taxpayers to pay for them, TOGETHER, WE PUSHED BACK," Live Action President Lila Rose wrote in an email to supporters. "Because of the pro-life pledges President-elect Donald Trump made during the campaign, we have an opportunity to significantly move the pro-life agenda forward." "If you and I only look to the government to end the holocaust of abortion, we’re going to be severely disappointed—forever," Human Coalition President Brian Fisher said, noting the culture, not just laws, must change. Trump won Catholics by SEVEN points. Podesta, Obama and Clinton's war on Catholics backfired. "We're waiting for Clinton to give her concession speech"
Below are the full statements various pro-life leaders released upon Trump's win. "In the past year, CMP’s videos exposed Planned Parenthood and the abortion industry’s barbaric, taxpayer-sponsored criminal scheme to harvest and sell tiny baby hearts, lungs, livers, and brains for profit. Yesterday, the American people voted for change agents to respect and protect even the smallest and most forgotten among us, including our unborn brothers and sisters. We can all now unite around commonsense, consensus pro-life policies and leave behind the failed pro-abortion extremism of the past." “It appears that Donald Trump has won the presidency of the United States. While we welcome this news, we are also keenly aware that our job as defenders of life and family begins again today. Let us pray that Mr. Trump will adhere to his campaign commitments regarding respect for life, and pray that he is surrounded with men and women of deep faith and strong integrity—men and women who have the courage and conviction to make the radical changes our government requires at this point in our nation’s history. With what appears to be Republican majorities in both Houses of Congress, he should be able to deliver on his pro-life campaign promises, especially defunding Planned Parenthood. “Both the presidential race and the control of the Senate came down to tens of thousands of votes in Florida, Ohio, and North Carolina. SBA List’s outreach to 1.6 million low propensity pro-life voters and persuadable Democratic and Hispanic voters in these three states sealed victory both for Donald Trump and the pro-life Senate candidates. “Trump’s victory is a victory for every American and for every child yet to be conceived in our great nation. We are relieved and grateful to the American people for their wisdom in rejecting Hillary Clinton’s radical and barbaric abortion agenda in favor of the Trump-Pence pro-life platform. This gives us great hope for the future. "The American people have issued a stunning rebuke to the political establishment. Donald Trump's victory provides a much needed opportunity to get America back on track again. "Exit polling reported that he captured 81 percent of the evangelical vote -- exceeding the evangelical support for Bush, McCain and Romney. In the third debate, Trump took on the partial-birth abortion issue and I believe that's the moment he closed the deal with evangelicals and solidified their support. "As I traveled the nation over the last few months, I saw values voters drawn to support Donald Trump because they recognized he shared their concerns about reversing the damage done to our freedom to believe and our ability to live according to those beliefs. "After 8 years under the Obama administration, religious freedom has never been more endangered than it is today. Our nation has an opportunity over the next 4 years to make freedom mean something again." “This is our time. This morning we are closer than ever to defunding our nation’s largest abortion vendor, Planned Parenthood; appointing pro-life Supreme Court Justices; and blocking taxpayer funding of abortion by permanently enshrining the Hyde Amendment. Donald Trump made many promises to pro-lifers over the course of his campaign, and the pro-life generation will make sure he keeps those promises as President. “Our nation rejected a party and a culture that supports not a single restriction on abortion. Abortion mattered in this election as it was the most-searched term in regards to the election on Google. "Planned Parenthood has been defeated at the ballot box. Despite the millions Planned Parenthood and its allies spent to elect a pro-abortion president and Congress, voters roundly rejected the abortion agenda of Hillary Clinton and the abortion industry that backed her campaign. When the abortion lobby pushed for unregulated abortions through all nine months of pregnancy and wanted to force taxpayers to pay for them, the American people pushed back. "Because of the pro-life pledges Donald Trump made during the campaign, there is now a clear path to end the public funding that enables the dismemberment, poisoning, or starving to death of one million innocent children each year. It’s critical that we unite to hold Mr. Trump to those pledges to defund Planned Parenthood, to appoint pro-life Supreme Court justices, and to ensure that taxpayers are never forced to fund abortions. "Planned Parenthood gets $1.5 million in taxpayer funding every day -- nearly half of its budget -- which allows it to keep its doors open and ruthlessly slaughter 887 children a day. It’s time to put Planned Parenthood and the abortion industry out of business. Earlier this year, for the first time in history, both the House and Senate sent a bill to President Obama to end the forced taxpayer funding of America’s largest abortion chain, and Obama rejected it. President Trump has pledged to -- and must -- sign that bill. "Public opinion on abortion is transforming as more and more Americans recognize life inside the womb and refuse to accept the idea that women’s rights are incompatible with children’s rights. Increasingly, Americans are pro-life and demand better for both women and preborn children than the violence that our laws condone. "Live Action’s platform and compelling visual media are educating millions of people every week with the truth about abortion and human dignity. We will continue our efforts to expose the violence of abortion and work with the new Congress and president to stop the billions of taxpayer dollars that prop up the abortion industry. United, the pro-life movement can eradicate the greatest human rights abuse of our time and rebuild a culture that respects every person’s most fundamental right -- the right to life." "Today is a great day for America and the Church, and a debt of gratitude is owed to all who boldly spoke up, worked, and voted for pro-life candidates, starting with our new President-elect. I am grateful to all of you and our whole team for all the work of this long, contentious election cycle. "Our nation will now embark on a path to eliminate abortion and to foster the freedom of the Church. We will be able to advance such an agenda because of the pro-life majorities that now exist both in the House of Representatives and in the Senate. "In particular, this election victory means the end of the HHS mandate, against which Priests for Life was one of the first groups to launch a challenge in federal court. That challenge, joined by various dioceses and other groups, has gone all the way to the Supreme Court, and is still unresolved. Now, however, we see a bright light at the end of the tunnel. "Priests for Life will continue to be at the forefront of the pro-life efforts both within and beyond the Church – and by “pro-life” we mean specifically working to end abortion and restore protection to children in the womb. "We at Priests for Life – and I personally – welcome all who want join us. We are an open book, and we renew the invitation which we have extended multiple times in the past to all clergy and laity, to come and visit us and learn more about what we do and how we do it. "For what we do, we face much opposition and even hostility. We are not concerned about any of the criticism that has been launched against us, whether from within or outside the Church. Such opposition is a way of life for those who actively work to end abortion. Opposition and criticism do not burden me or my team at all, because there is a far greater burden every single day our my minds and hearts: the continued slaughter of thousands of children every day by abortion. "Added to that burden is the silence of so many laity and clergy, and countless faithful have had enough of that. "We have no dispute with anyone who wants to end abortion, but only with those – such as the majority of Democratic politicians – who want to hide it and allow it to continue. For many years, and right up to this Election Day, many of the attacks launched against me and my organization have been motivated by partisan politics, and in particular by Democratic supporters who know the damage our work does to their abortion agenda. We are proud to endure those attacks and, as has happened in this election, we will continue to be victorious."